Saragossa April 10th, 2019. Safe Creative implements an audit process of registered records in Safe Creative based on blockchain. New guarantees for Safe Creative’s premium users. More strength for all registrations made. Safe Creative designed in 2007 a copyright registration model based on the generation of technological evidences. The generation of hashes or cryptographic traces of the registered files, and a redundant time stamping. 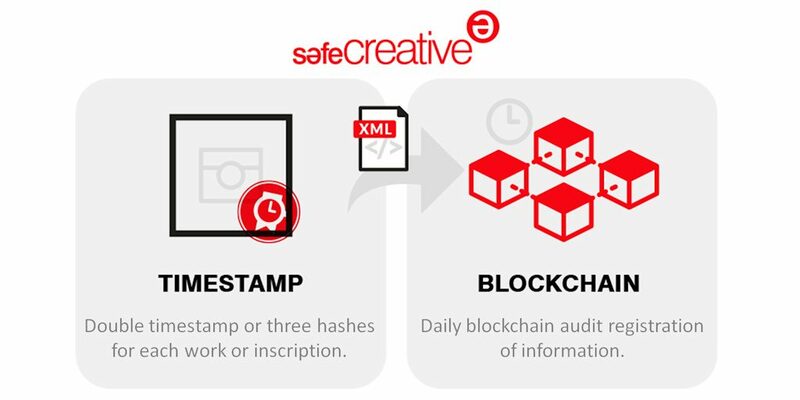 As of April 10, 2019, Safe Creative includes an additional layer of security: an audit process based on blockchain. We’re including an additional guarantee of the integrity of the records made over time. This is possible thanks to the technology that emerged in these years from distributed databases -distributed ledgers, DLTs- or blockchain. The strength of our double redundant time stamps and 3 cryptographic hashes for each registered work, is reinforced with a new process. An audit record hash with the identification information of all the registrations made in the previous 24 hour period is recorded on the distributed ledger of Ethereum. This process adds a new guarantee of integrity and registration date with the strength of this solid technology. The incorporation of the Blockchain technology in Safe Creative adds an unquestionable audit process due to the public and indelible nature of the blockchain. It has been implemented in such a way that this same strength does not compromise the privacy rights of Safe Creative users. The audit system generates an electronic document in XML format every 24 hours with the list of cryptographic footprints of all registration proofs generated in Safe Creative. Then it incorporates the XML’s hash into the blockchain. The file contains their digital fingerprints instead of literal works or information. This way, if the fingerprint of the registered file corresponds to that included in the audit file, it is guaranteed that it’s the same. This process allows detecting any modification in a registration or in the audit XML itself. 3.- How we check that the blockchain registration is correct. From the “info in blockchain” icon found in the worksheet, you can check the necessary information to perform the audit of the record. 1.- The cryptographic footprints of the work and registered inscriptions. 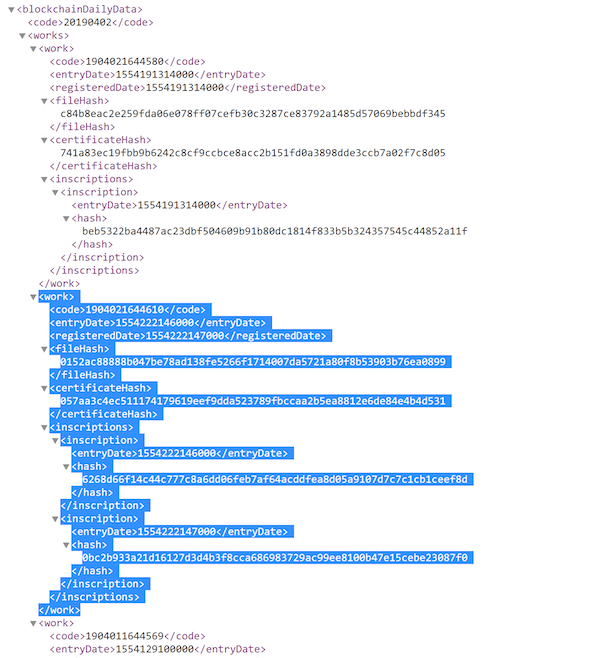 2.- Link to the audit XML file together with its hash. 3.- Link to check the transaction in blockchain. It’s possible to check the text in which the registration hashes are found from the link of the file or XML audit file. 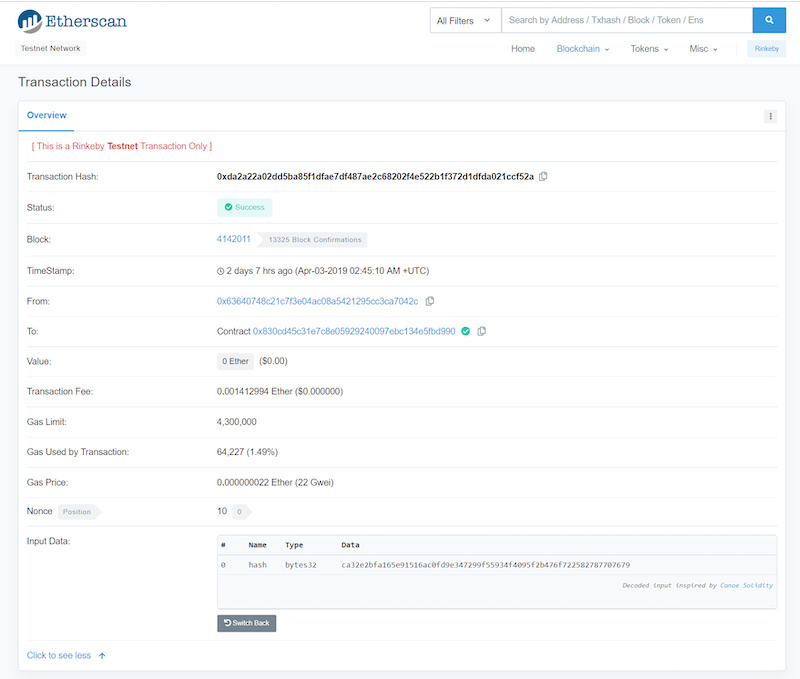 You can verify that the hash of the audit file is registered in the blockchain from the link to check the address in blockchain.